It took me a couple of months… but I got another version of the Christmas Lane quilt made up with a pattern. I decided on this soft, spring like color palette after seeing this picture, then I pulled all of the fabrics from my stash and scrap bin. I laid it over a bed and now I’m obsessed with making a version for my own bed. I sent this one to Kathy to be quilted. She always does an amazing job and the texture her quilting adds is beautiful. I love this swirl design she does…I think this is the 3rd (or 4th!) time in a row I’ve asked for it! A green stripe binding finished it off and the sun came out just in time to snap pictures. This is a beginner friendly pattern and comes in 3 sizes. It uses Layer Cakes, Fat Quarters, or 1/4 yards (a photo of the back with material requirements can be found here, in the 2nd photo). You can find this pattern here as PDF or paper pattern. Happy Quilting! 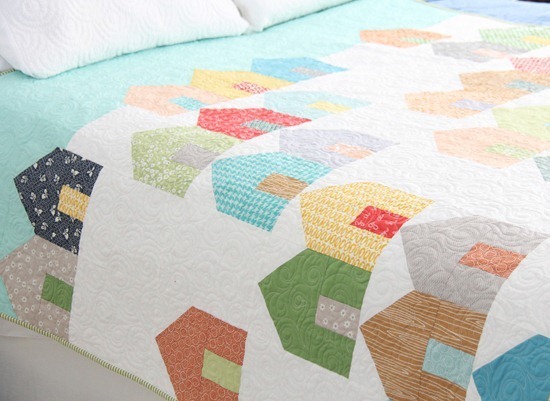 Love the quilt, simple and fresh and it makes a great gift for young and old. Reminds me of summers at the beach. It was cute before but now in those colours I know I'm going to have to make one for my biggest girl who would just love it. Yippee for another great pattern. I love it! Thanks so much for putting the pattern together for us. Oh how cute Allison!! I love it!! What a happy little neighborhood! Yes please…lol. Love it Allison!! Adorable. And that swirl quilting is perfect! Oh, how CUTE! And thank you so much for sharing the photo that inspired your color palette. Lately I've been tearing pages out of non-quilting magazines, images of paintings or interior design projects that I love, to study the color palette and the balance of colors and textures. I'm hoping I can use those images to inspire new quilting projects that take me out of my comfort zone. It's really interesting to see where others find their inspiration! These look like the beach huts at Southwold in the UK. Lovely! I've been waiting you publish the pattern and now I'm so happy to get one for my self. And since I'm a beginner, do you have any suggestion how I can finish the quilt ? straight line? 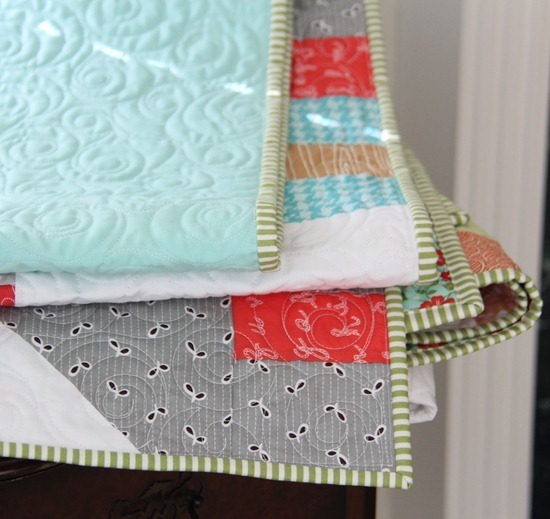 or hand quilt? another beautiful, totally amazing quilt. Love, love, love!!!! 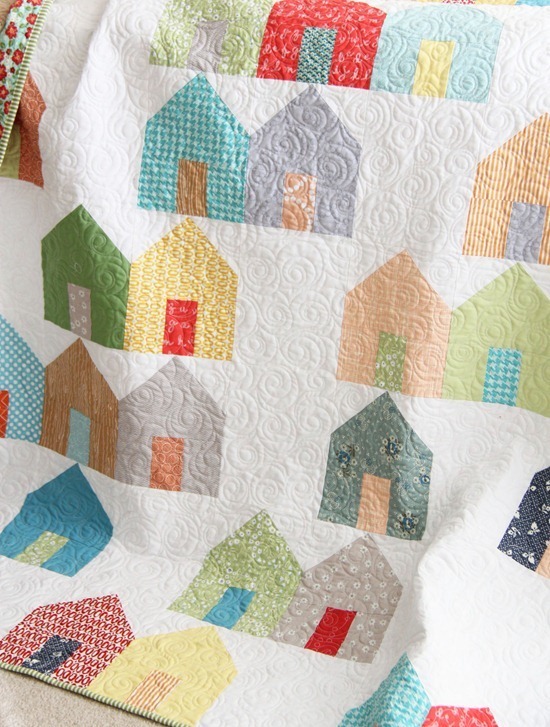 Love your new Suburbs pattern… and ordered it! 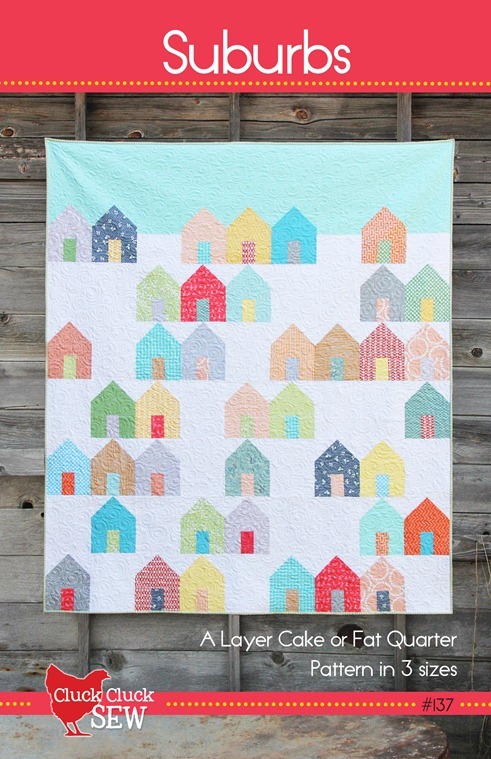 I've wanted to make a house quilt for a long time and this is just perfect for me. BTW, thanks for making your PDF patterns cheaper than your paper patterns. There are patterns I might order from other designers, but it just irks me that the price is exactly the same. Amazing what a 50 cent price break means to someone who thinks like me! So fresh and springy in your neighbourhood! that one's adorable! nice job. Love it, love it, love it. I especially liked seeing your inspiration for the color scheme. I just bought a copy of the pattern & I'm going to use my own travels to inspire me! How perfect! I love the colors on this version, and the binding is lovely. Oh this is just beautiful! Love those soft colors and I'm always drawn to house blocks for some reason. Amazing pattern! 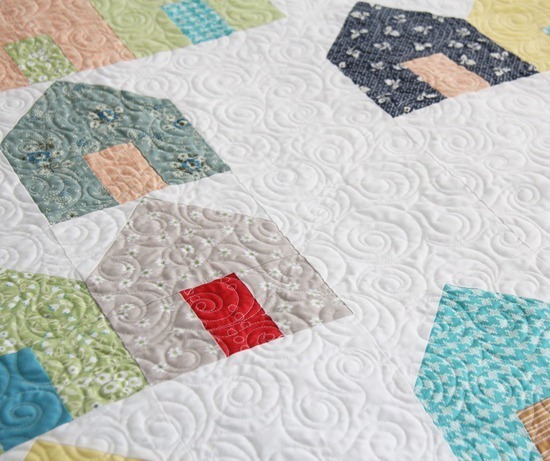 Love the coours you chose this time and the quilting is amazing! Definitely a must-do. Love it!! I've been waiting for this one. I love it in those colors too. You have SO much talent! Love this quilt! I'll have to make one of these. :) And also, darn! I just ordered a pattern from you last night before I knew about the code. I should have waited! Hi Al, This might be my favorite pattern of yours!!!! I love it! I'll order it! Oh I LOVE this – it's like it speaks to me !! I love this quilt. 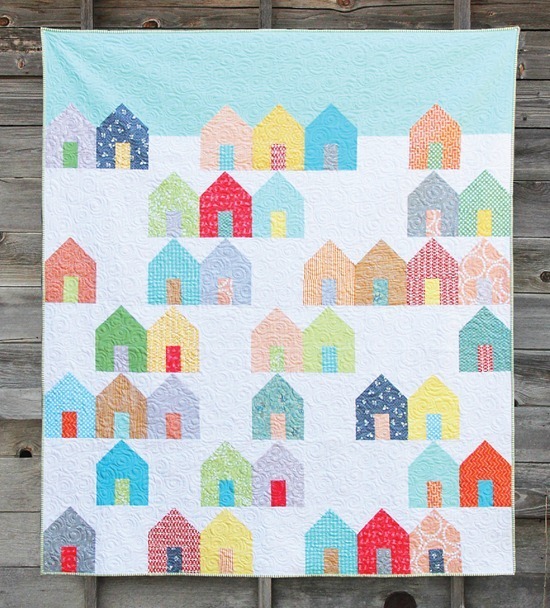 I need to make a house warming gift quilt for my little sister soon and this will be perfect. Thanks for making a pattern. Thank you for the house quilt pattern, and thank you for the coupon code! I just bought 5 patterns – it was like buy 4, get the 5th free. Who could resist! I love the Suburbs pattern done in the low volume fabrics. It looks simple and fresh and unique. I think it would make a marvelous gift quilt for friends and family alike! Did you use a collection for the houses or fabrics from a variety of fabrics? Also, are you willing to share the name of the solid you used for the sky? It's perfect. I really REALLY like this one, especially with the lovely sky at the top. We even did similar quilting on the quilt! Great minds think alike! Love this- so glad to see the pattern, and the great price! Thanks! Such a sweet neighborhood! I love the colors you used in the sample. May I enter the drawing for S is for Stitch. This is sooo cute – sigh :) ! Love it's beginner friendly too. I love the simplicity of the house shape. Just finished binding my quilt and I love it. Thank you so much!! !